Grand ole Opry star Roy Acuff & his Smoky Mountain Boys present 12 great train songs on this reissue of the Hickory Records LP, originally released in 1965. One of his most famous recordings, Wabash Cannonball, is included plus Night Train to Memphis, Fireball Mail, Freight Train Blues, Hank Williams' Pan American, Tennessee Central (No. 9) and The Glory Bound Train. The tall tales and locomotive rhythms of railroad lore of the American South were part and parcel of the 20th Century country songbook. Roy Acuff (1903-1992) was the revered King of Country music, a Grand ole Opry icon tenaciously rooted in tradition. During his heyday, trains were the primary means of transportation for people and freight. The rhythm of the rails provided inspiration to many a songwriter, both black and white. 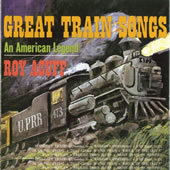 Like Jimmie Rodgers before him and The Delmore Brothers, Johnny Cash and Merle Haggard afterwards, Acuff's many train song recordings continue to delight rail and music fans to this day. Enjoy locomotive rhythms and railroad lore plus a live recording made in Munich, Germany with Country Music Hall of Fame legend Roy Acuff & his Smoky Mountain Boys.